The thing about arriving on Patrice's porch on a Thursday instead of Wednesday is that I miss all the other ladies and their chats. Mind you, it does mean I have Patrice and her tea and cakes all to myself. Method in my madness, you see. Have you ever colored your hair? If so, what colors have you tried? Oh dear me. Patrice, I'm not sure you ought to have brought this up. When I was a teenager, I trained for 2 years to become a hairdresser. I was away from home, and - as one does in hairdressing college - I pretty much went through the range of shades for hair colour. However, one shade... er, hang on... one colour kinda takes the biscuit. I'd coloured my hair blonde - that's bad enough to think of now - but then we dyed the front area a cerise pink colour. My hair had the 1980 flicks all around the area that framed my face, so these flicks were a bright, bonny cerise colour. At the end of this term, I was coming home for a break. I still remember my Mum's face when she saw me coming off the ferry. Suffice to say it wasn't the most welcoming welcome I've ever had in my life. I do enjoy music. I don't like all kinds of music, and much of what may pass for music wouldn't be music in my mind. There are some kinds of music which were very much part of my life before I was converted and, although I'd possibly still enjoy the music, I'm not sure that it would be beneficial for me to take my heart where the music would lead it. I often listen to the classic hymns, or classical music too. I honestly find music so emotive that I do try and be careful what I have on. Being a country bumpkin, country music would always have been a favourite. I think my boots would choose this genre, but there's quite some time since I played it myself. What are the last three movies you watched? Mmm. Well, we watched the Chicken Run the other night together. Normally, winter in our time for family movie nights, but we did fit one in recently and watched this one (again!). It's so well done. Really, I think the adults love it more than the kids. Oh hang on - maybe that's only me! We were given The King's Speech last week and the Builder and I sat and watched it. I had heard a bit about the language in the movie. Mmmm. I wished we hadn't watched it. Aside from the language issue.... I just didn't think the movie was up to much. I wasn't keen on the way King George VI was portrayed, and I didn't like Helena Bonham Carter as the Queen Mother (not that she was Queen Mum then, but that's what she is to all of our generation!). Even with the swears edited out, I wouldn't go out of my way to watch this movie. Oh yes. Her name was Game, she was a miniature Shetland Collie and she was absolutely gorgeous. For years and years, I'd pleaded with Mum and Dad to buy me one, and when I was twelve years old, Game came into our home. My mum still gets emotional when she speaks about her. By the time she died, I was living away, married and with my own baby, but my mum was absolutely devastated. What was the best or most interesting "back to school" thing from your childhood? Er, Hmmmm. Give me a minute here. Nope. Can't think. I'm not sure we did 'back to school' things. It's Lewis. We just got on with things. No niceties here, Patrice. But talking of 'back to school'. We kinda began today. We got a bit of a start, and will spend today and tomorrow getting used to new materials, sorting out our schedule (er - why did you all splutter on your coffee. I do have a schedule. It sits nice decorating my kitchen wall. Sometimes, I even look at it. ), and making sure we've got all the equipment and stationary we need. Everything we ordered online has come, which is a real bonus. So it's 'off to work we go'! The schools on the island went back today too - it's much earlier in Scotland than in England. That's why us Scots have always been more ejoocated than them South of the Border. You didn't know we were? Oh yes, it's a commonly known fact. Here in Scotland, anyway. Actually, Patrice, it's so sunny right now, and there is so little wind, that we could almost have had this chat on our porch. 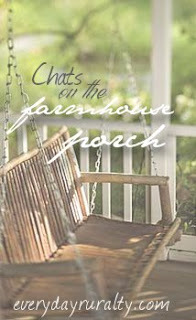 I simply LOVE these porch chats! :) I really should get into more of these types of things. They are fun. I had Ronald McDonald red for a short bit... it was in my adulthood after I was married so that makes it worse. I'm just catching up with the chatting. I have always wanted to dye my hair a lovely magenta or maybe turquoise. Never had the nerve. You are so funny! I wish you had a photo of your pink/blonde hair style! Oh, Anne.....I want to see a picture of the pink hair!!!! Please??? I never colored my hair....and now....well, the LORD is highlighting my hair with "natural gray." Thank you for the introduction to Enaudi's music.....BTW, I totally agree with your thoughts on music.